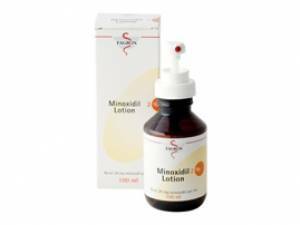 Minoxidil is a medicine used for the treatment of hair loss. The lotion contains the active ingredient minoxidil, which stops the process of hair loss and stimulates hair growth. Minoxidil can be used by both men and women and is available without a prescription. If you would like to order Minoxidil online, Dokteronline.com's partner pharmacies will be happy to assist you. Hair loss is a common problem. For most people, hair loss worsens with age. When someone has hair loss, the hairs that are lost don't grow back. Baldness can occur in both men and women. Male hair loss is characterised by a receding hairline and hair loss on top of the scalp. Female hair loss commonly presents itself in a diffuse pattern, where hair is lost over the entire scalp. Minoxidil can stop the balding process and, in many cases, also stimulates the growth of new hair. Minoxidil lotion should be used daily on dry hair and scalp. Apply the solution with the spray if you want to treat the entire scalp. You can also use the dab method to ensure that you are applying Minoxidil to the correct area. Always follow the instructions on the package leaflet. Wash your hands directly after applying the lotion and avoid contact with the eyes, nose and mouth. It can take some time before the effect of this medicine is noticed. If no improvements are seen after using Minoxidil for eight months to one year, you should stop using it and seek advice from your doctor. If your hair growth is stimulated, you will need to keep using the lotion for the growth to continue. Regrown hair may disappear after you stop using Minoxidil and the balding process will then continue. Adults: apply 1 ml of the lotion to dry hair and scalp twice a day and massage into the affected areas of the scalp gently. This medicine is not suitable for use in children under 18 years of age. Read the package leaflet before use. Skin irritation (itching, burning, dryness) at the application site. You have any scalp abnormality (e.g. irritation, infection, sunburn, broken skin) or a skin condition. Consult a doctor on the use of Minoxidil if you are taking medication to make sure the combination is safe. For more information, see the package leaflet. Minoxidil should not be used by pregnant or breastfeeding women. Stay out of traffic if you experience side effects that make you feel less alert than normal (e.g. dizziness). Minoxidil does not interact with alcohol.